In the Glyph Edit Window you can press "H" to hide the screen clutter, but did you know that by pressing "Alter H" you can hide it and keep it hidden? When you want to focus just on the shapes of the glyphs it helps to hide the guidelines, etc. Hide the screen clutter (Alter H). You can still select contours with the shortcut keys or mouse. The status line shows the position should you need it. Do you have any more simple tips? Last edited by Bhikkhu Pesala on Sun Sep 21, 2008 11:34 am, edited 2 times in total. Double-click on the ruler and clear all, or select individual guidelines and click on delete. 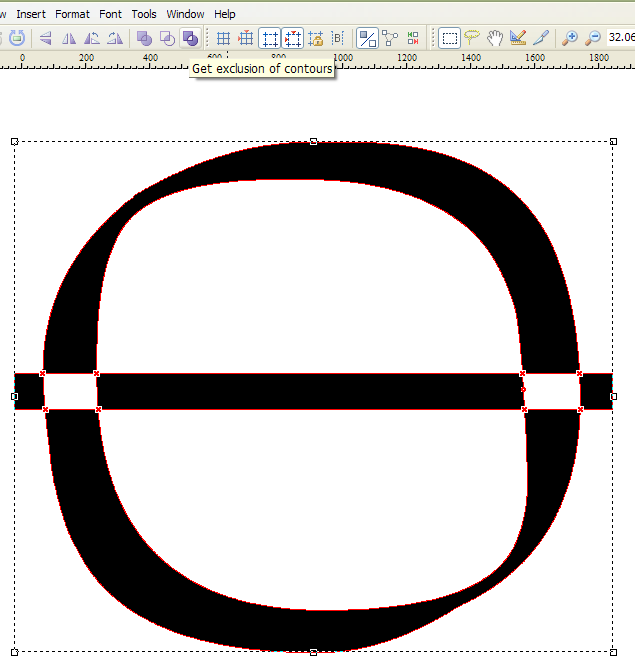 When FontCreator completes composites it aligns diacritics on the horizontal geometric centre of a glyph. 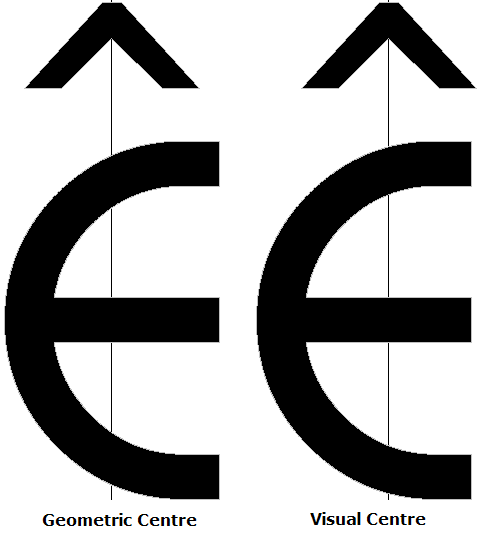 The circumflex accent will be centred on the Capital E, for example. 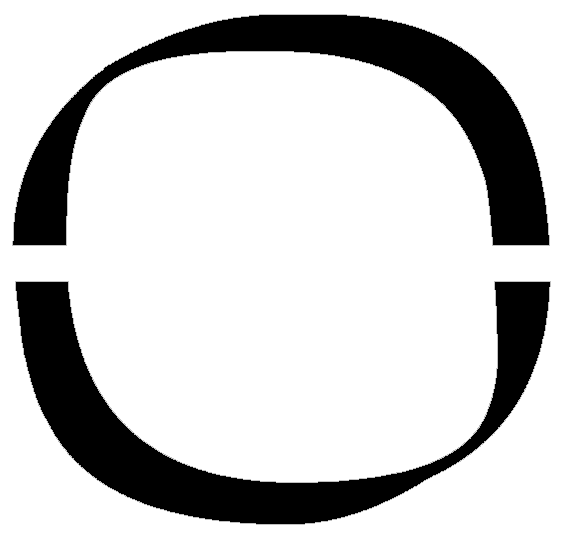 Acute accent is offset to the right so that its one third point is centred on the base glyph, while grave accent is offset to the left. 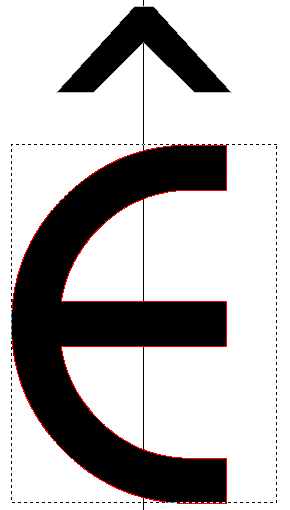 On some glyphs, like the capital E illustrated below, this looks off centre because the visual centre is a long way from the geometric centre. 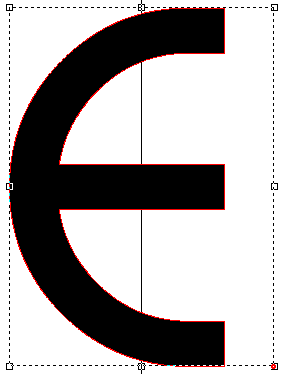 To adjust the geometric centre of the capital E so that it aligns with its visual centre one can add a single node contour. (Single node, or two node contours won't print. We can use them at the design stage and remove them later by using the font validation wizard). 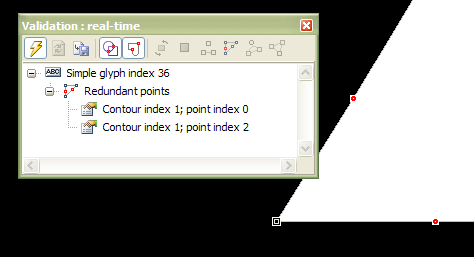 Insert a rectangle from the Drawing toolbar, select three nodes and delete them to leave a single node contour. Move the single node contour until the geometric centre aligns with the visual centre. You can see where the geometric centre is from the middle handles when all contours are selected. Drag a vertical guideline to where you think the visual centre should be. This is best done with no bearing lines in view to distract you. Now, when you use Complete Composites, the accents will be aligned optically rather than geometrically, and all other accents over or under the Capital E will be correctly aligned too, because the geometric centre has moved. One can also move the geometric centre of accents in exactly the same way by adding a single node contour. Last edited by Bhikkhu Pesala on Sun Sep 21, 2008 11:32 am, edited 2 times in total. Now, you can easily see if the spacing and kerning are right, and if the design works aesthetically or not in a line of text. Here is the same text with Pali Italic. You can tell at once that I forgot to adjust the right side-bearings on the Qu ligature after moving the "u" to join the "Q," and in the fi after moving the i to join the f.
The contour joining the st and ct is too heavy. It should be more like the contour joining the ck. The sp ligature uses the "p" and "s" from the regular type style, not the italic typestyle Oh well! Back to the drawing board. Last edited by Bhikkhu Pesala on Sun Sep 21, 2008 11:31 am, edited 2 times in total. Sometimes you don't know the precise angle to use in the Glyph Transform wizard, or the amount of skew to use on the Transform Toolbar. The easiest method is to use the skew handles. Select a contour or several contours with marquee or shift select, and click the selection again to get the skew and rotate handles when you mouse over the selection handles. Carefully grab the skew handle and skew the selection as you wish. 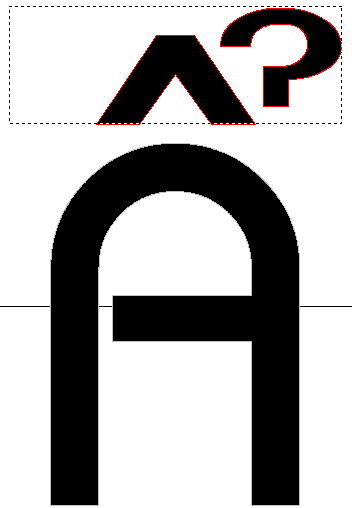 After skewing glyphs you will see some off-curve extreme points highlighted by the validation toolbar. Last edited by Bhikkhu Pesala on Sun Sep 21, 2008 11:31 am, edited 3 times in total. Delete any excess nodes at the bracket, leaving only three on-curve nodes, or add an on-curve node if needed. Drag the middle node of the three horizontally in line with the third node until the first node shows as red. The red nodes indicate that an on-curve node is redundant because it is in a straight line with another on-curve node. Press the "F" shortcut to convert the middle node to an off-curve node. Now the Validation Toolbar shows a different error — the off-curve node is an off-curve extreme. 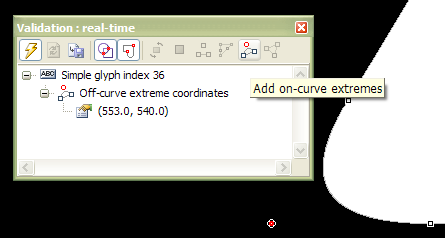 Click the "Add on-curve extremes" button on the validation toolbar to correct this problem. The result is a smoothly curving bracket. Last edited by Bhikkhu Pesala on Sun Sep 21, 2008 11:31 am, edited 1 time in total. Draw a rectangle, select all and centre align middle. Drag select with the mouse to select the three offcuts, and press delete. 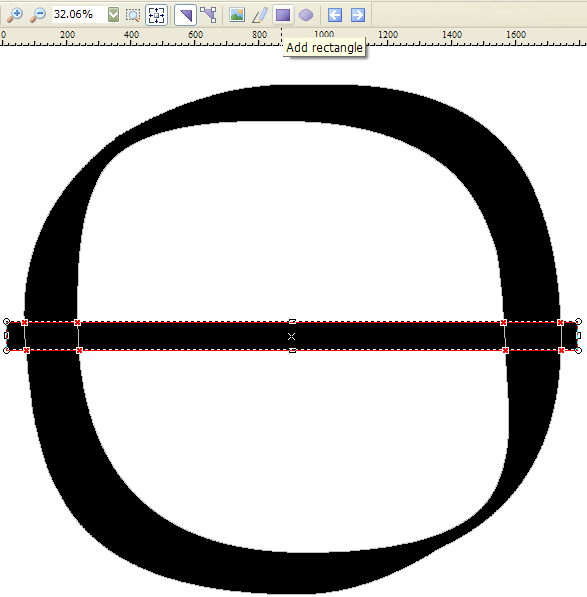 In the latest version of FontCreator one can simply drag the centre of the line, but one will still have to fix off-curve extremes, so this method is still useful to know. First add a node between the start and end of the line with the shortcut "a"
Convert this on-curve node to an off-curve node with the shortcut "f"
Drag all of the selected nodes with the mouse to reshape the curve or curves together. Hold the shift key while dragging to restrain the movement to horizontal or vertical. If you have the Professional Edition, Complete Composites can be used to create many composites, for example to create subscripts from superscripts. However, if the glyphs are not mapped, for example, if you want to create denominators in the Private Use Area from superscripts, or if you're using the Home Edition, then Complete Composites won't be an option. However, composite glyphs can be created by selecting the glyph members in the glyph overview, copying them to the clipboard, then pasting them into the empty glyph where you wish to create the composite glyph. To speed up the process of creating all ten denominators from the ten superscripts, copy them all at once, paste them all into the target glyph, then delete those you don't need. Select all ten superscript glyphs in the glyph overview using Shift + Click, and Ctrl + Click. They will probably be in the order: 2,3,1,0,4,6,7,8,9 if the font is sorted in the standard order. Insert ten empty glyphs at the end of the font. Denominators intended for use with OpenType Features don't need to be mapped. Or, you can map them to code-points in the Private Use Area. Press the delete key to delete the selected glyphs, and use the shortcut Alt Right cursor to move to the next glyph. Paste the clipboard contents again (Ctrl V), and repeat the process for the next denominator. 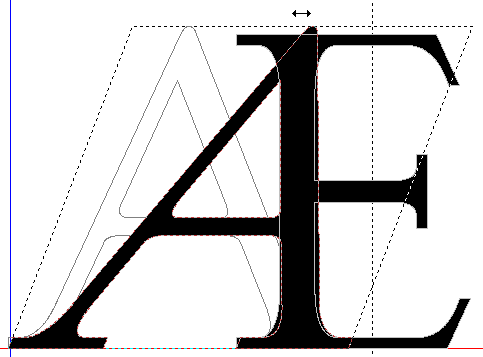 Using composites instead of simple glyphs reduces the size of the TrueType font file and makes the font easier to edit. If you later decide that the superscripts need to be bolder, for example, you only need to edit the superscripts, for the subscripts and denominators to be updated too. Update: If a large numbers of glyphs are pasted, disable Automatic validation, and hide the Glyph Fills (shortcut Ctrl H in FontCreator 9.0.0.1916). 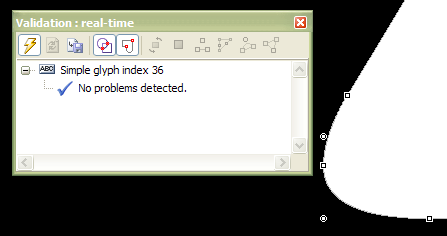 Fill Outlines is a global setting that affects all Glyph Edit Windows. Last edited by Bhikkhu Pesala on Mon Dec 31, 2012 9:54 pm, edited 3 times in total. Here's a tip to maximise working space by arranging a couple of floating toolbars over the otherwise unused FontCreator Window Title Bar to the right of the Help Menu. With the FontCreator maximised, its impossible to drag the toolbars to the position shown, but if it is first restored, and moved or resized away from the very top of the monitor, any of FontCreator's toolbars can be left floating with their title just outside the monitor area. On my 1280 x 1024 monitor, the Glyph, Align, and Standard toolbars will just about fit on one row with a few pixels to spare. 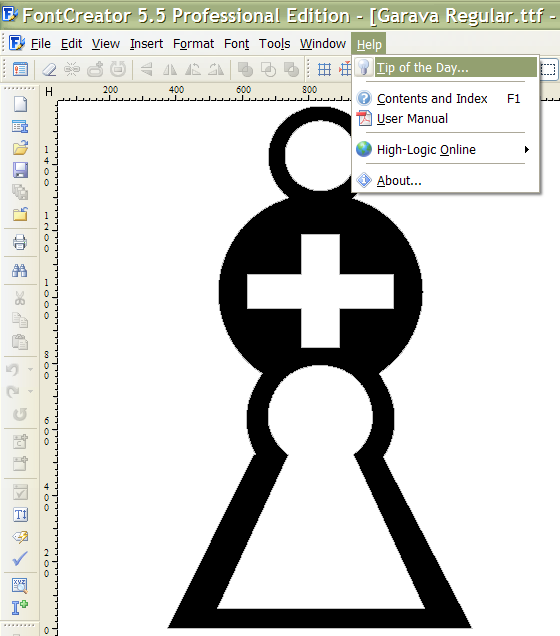 The Grid toolbar and he Drawing toolbar can be left floating as shown. After arranging the toolbars as you want them, maximise the FontCreator window again. Don't try to move the floating toolbars, or they will snap into a docked state. Double-click the toolbar handle to undock them if you dock them by mistake. They can be moved by dragging the left or right sides to resize them. The text used for the Web Font test is not currently editable. Here's a hack that you can use at your own risk to use any text of your choice in the test page. On running the test page, select the Preview Text "Alphabet — Numbers"
Have you ever tried to rearrange the Tabs on the Tab Bar? I am used to this behaviour in Opera browser, and like to keep my fonts in order for quicker selection. In Tools, Options, General, I have the Startup Option set to “"On start open files from last time,” which is a great time-saver when working on a complete set of fonts. However, the fonts don't always open in the same order as last time. In fact, they open in the order that they were last viewed. In FontCreator 7.5, “tags.txt” is in the FontCreator installation folder in C:\Program Files (x86)\. You can still edit it, but you will need Admin permissions to modify it. Many code points in the Private Use Area are used by FontCreator for OpenType glyphs such as Petite Capitals, Discretionary Ligatures, OldStyle Figures, etc. Glyph names can be changed by clicking the Autocomplete button on the Glyph Properties dialogue, then clicking on Apply. I attach my heavily edited glyphnames.dat file. Extract it to your %AppData% folder to see the effect, or use it as the basis for your own preferred changes.